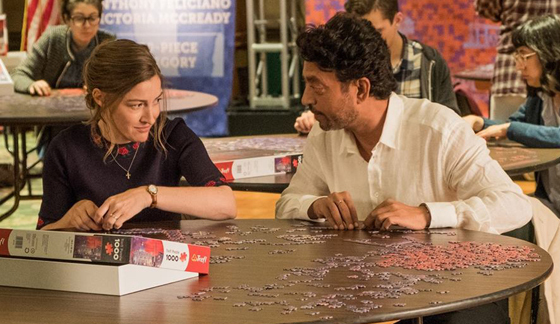 It’s sounds cheesy I know, but there’s nothing puzzling about “Puzzle,” a wonderful new drama based upon a 2010 Argentinian film of the same name. Directed by Marc Turtletaub (“Gods Behaving Badly”), who is perhaps better known as a producer of such silver screen works as “Loving” and “Little Miss Sunshine,” “Puzzle” is an engaging tale about a woman’s empowerment after being taken for granted for at least all her adult life. The spark which fans the flames comes from nothing less than a 1,000-piece puzzle set. Anges (Kelly Macdonald, “Brave,” “No Country for Old Men”) is a suburban, soft-spoken, anti-technology housewife stuck in the same routine every day – getting her husband, Louie (David Denman, “The Office,” “13 Hours”) up for work, cleaning, shopping, cooking for three men, and volunteering at church. That’s pretty much her entire life. She does know she is stuck in this monotonous cycle, but she is unwilling or unable to break free. We get a taste of this right at the beginning when a birthday party turns out to be one she has thrown for herself, complete with a house full of guests and a cake. However, Agnes, for whom we instantly feel a great deal of frustration for, is more intent on fixing a broken plate than being around other people. Afterwards, she discovers a gift from a friend – an orange and brown-hued map of a world she has only dreamed of seeing. With the simple placement of one piece the art of puzzling suddenly becomes an obsession for her. The thrill she gets gives her the confidence to text Robert (Irrfan Khan, “Jurassic World,” “The Lunchbox”), a champion puzzle player who is seeking a doubles partner. A wealthy inventor who spends most of his days watching catastrophes on the news, Robert is surprised by how fast Agnes is. It turns out, though, that they are both lonely souls. Robert is recently divorced while Agnes suffers from being constantly belittled and taken for granted by Louie. When sparks fly it sets Agnes’s world on fire and while it scares her to death it also gives her a newfound confidence. Turtletaub has crafted an evenly-paced work of cinema with subdued colors throughout. The exceptions are often the puzzles themselves when color is emphasized. He also draws out an excellent performance from Macdonald, which could be the best she has delivered. Macdonald effortlessly fleshes out her character’s extreme timidity while infusing her with enough likability that you can’t help but root for her as she transforms into a ferocious butterfly. The physical chemistry between her and Khan comes off as awkward, but the dialogue they share is beautifully written and delivered. Throughout his career, Khan has often had a soulful, philosophical way of conveying lines and he doesn’t disappoint here. 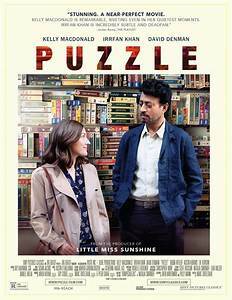 “Puzzle” is certainly not a ground-breaking work of cinematic art nor will it probably rank among the pantheon of the best movies of the year. Still, it remains a sweet, delightful work that is as pleasing as finishing a puzzle on the porch while a gentle spring rain pitter-patters on the roof above.